Children's UK entertainment retailer, Smyths have created a DVD boxset, specially composed for the store giant. The Ultimate Movie Box Set which carries four Thomas & Friends specials is an exclusive, only available to buy in Smyths' many shops in Britain and Ireland. In reverse order, Day of the Diesels, Misty Island Rescue, Hero of the Rails and The Great Discovery are billed as The Best 4 x 60 Minute Movie Adventures! as the description reads. Thomas the Tank Engine 4 DVD Boxset includes the following DVDs: Day of the Diesels; There's a fire on Sodor and two new firefighting engines Flynn and Belle arrive to help Thomas and Percy save the day! When Thomas starts spending all of histime with Sodor's newest heroes, Percy is drawn to the Dieselworks, where he is made to feel special by the master of mischief himself, Diesel 10! But Percy doesn't know that he is part of Diesel 10's master plan to take over the Steamworks. The Steam Team rallies for sure-fire excitement in this unforgettable movie from Thomas & Friends! Misty Island Rescue; The engines are hard at work to build a new Search and Rescue Centre. 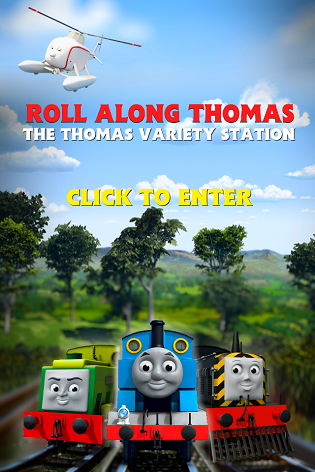 When Thomas helps a friend in need, he is rewarded with an exciting trip to the mainland. Along the way, he gets lost at sea and finds himself on the mysterious Misty Island, where he meets new friends Bash, Dash, and Ferdinand. Together they discover secret hideouts and try to help Thomas find his way home. Will The Fat Controller's search party ever find Thomas? Hero of the Rails; During a daring race with boastful Spencer, Thomas discovers an abandoned engine from a far off place. Fearing Hiro will be sent to the Smelters, Thomas enlists his trusty engine friends to help repair him. But will sneaky Spencer foil their plans? Jump on board for adventure and excitement in Hero of the Rails! The Great Discovery; When Thomas discovers the long-lost town of Great Waterton, The Fat Controller declares that the town will be restored to mark Sodor Day. Stanley, a bigger and stronger engine, arrives to help but Thomas feels under threat and plays a trick on him. When the plan backfires, Thomas finds himself lost and alone with the whole island hunting for him. Will Thomas be found and make it back to restore Great Waterton in time for Sodor Day? Ultimate Movie Box Set is available to buy in Smyths stores in the United Kingdom and the Republic of Ireland.